Vermont is getting warmer in winter twice as fast as in summer. As the global climate warms, Vermont is also getting warmer. 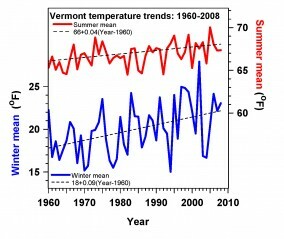 If we look at the temperature records for the past fifty years, we see Vermont is getting warmer in all seasons – especially in winter. 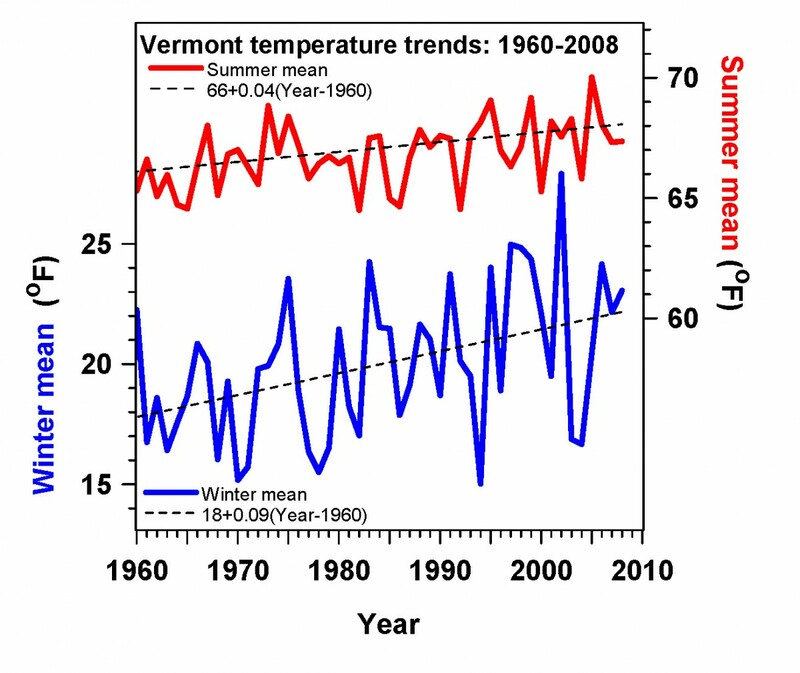 Figure 1 shows the mean Vermont summer temperatures (at top in red) and winter temperatures (below in blue). 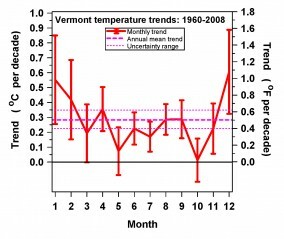 They are an average of four Vermont climate stations from 1960 to 2008. Trend lines have been fitted as dashed lines. The trend in winter is more than twice as large as in summer. So if fifty years, mean winter temperatures in Vermont have risen 4.5 ◦F (2.5 ◦C); while in summer mean temperatures have risen less, about 2 ◦F (1.1 ◦C). This is just the mean trend: there is an uncertainty in the trends of about 30%, because of the large variability from year to year. Note also that the variability from year to year in winter is also more than twice as large as in summer. Looking ahead, these trends are likely to continue for the next few decades - and accelerate unless we reduce the burning of fossil fuels. 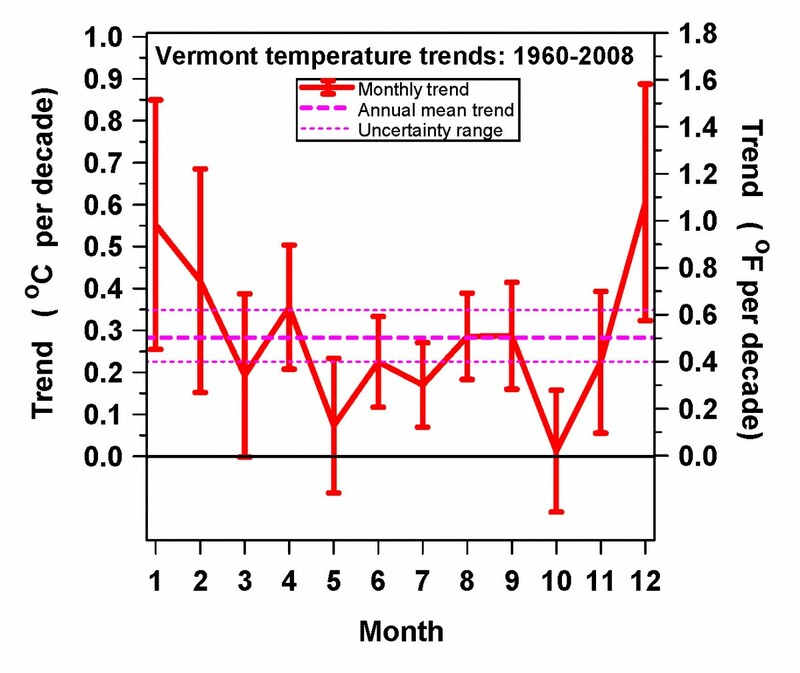 Figure 1: Summer and winter temperature trends in Vermont since 1960. Figure 2: Monthly temperature trends and the annual mean.